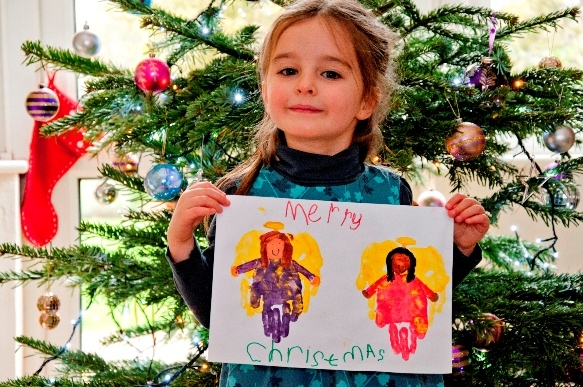 Our Christmas card competition winners revealed...and the best of the rest! When we launched the ‘CVS Design a Christmas Card’ competition we knew we would be in for a treat…but we had no idea how hard it was going to be to choose our winners! A massive thank you to everyone who took the time to enter. We received hundreds of entries, all of an incredibly high standard and it is clear a lot of time and effort has gone into the designs. It was a really tough decision for our panel of judges, which included Richard Cooper from children’s charity Honeypot and Sarah Jackson from the organisationWorking Families, but we finally managed to select one winner for each of the three age groups. A design featuring two angels cleverly made from handprints saw talented toddler Elissa, aged 4, take the prize for the 0-5 years old category. Elissa loves art and as well as designing a card for CVS she has also been busy working away making Christmas cards for all her family. Young artist Ellis, age 8, took the top spot in the 6-10 years age group. He impressed the judges with his clever and intricate design for a Christmas card featuring a festive tree. Ellis hopes to become an architect one day and according to mum Sara, is always drawing something! Finally, in the 11-16 years category, teenager Natasha’s wintery design was crowned the winner. Her image of a snowman and an ice skating fairy really grabbed the judge’s attention with its festive spirit. For each of our three winners Christmas has come early as they have each received £150 worth of arts and crafts supplies. Their winning designs are also being enjoyed by thousands of people, as they have become our official Christmas e-cards, going out to employers, carers and parents registered with CVS. To view the three winning designs and to see some of the brilliant entries we received, take a look at our facebook album!